Here's a B3, a B6 and a B7 Bigsby-all vintage plus the "short" hinge 3 screw hinge piece. I don't have a B5-that's the 'horseshoe' type you see on solid bodies. Only the B7 is correct Bigsby for a 335/345 and 355. Does it make sense to anybody that a Stratocaster with a hardtail is less desirable than one with a trem but an ES-335 with a trem is worth 15%-25% less than a stop tail? Those of you who know me know I don’t like Maestros on a 335 but I kind of like the sideways as long as you don’t touch it. It looks cool, OK? But a Bigsby, if you have the right one mounted is a pretty functional item. It makes a decent tailpiece so even if you don’t use it, it doesn’t crap up your tone. It changes it a little perhaps but not much. It makes it harder to string and it weighs 11 ounces which is a lot but it’s still a pretty durable invention considering how long they have been in use. Trems or vibratos as they should be called really weren’t all that popular until the early 60’s. The majority of 335s and 345s were stop tails. A lot of them got converted to Bigsbys later but by 1962, it seems that the Bigsby/Custom Made configuration was the default. 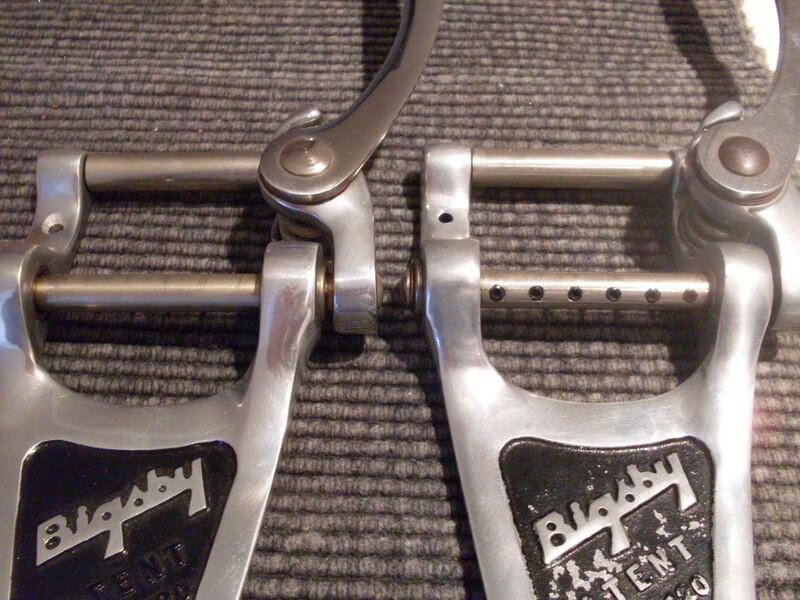 A little Bigsby history: It was invented, of course, by Paul Bigsby who designed guitars (and, arguably, the six on a side headstock) and a lot of other stuff as well. He received the patent in August of 1953 for the Bigsby Vibrato System and it is pretty much the same today as it was in 1953. There have been refinements along the way but the basic principle is still the same. The four main models (with all sorts of variations) can be confusing. 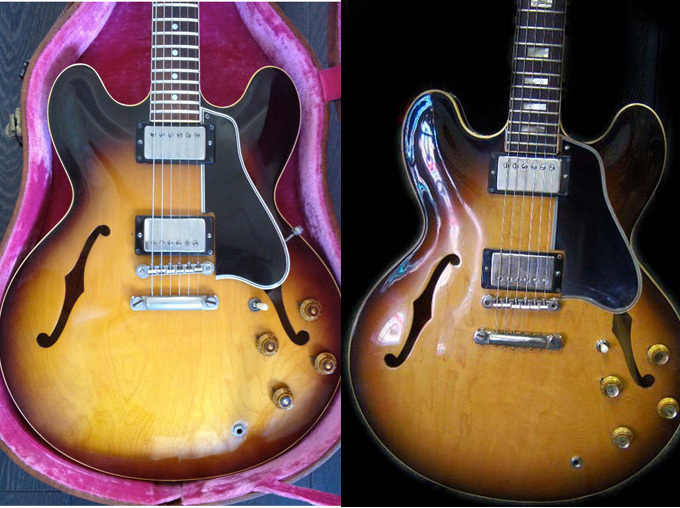 There is only one that is correct for an ES-335 and only one that was used by Gibson for the semi hollow line. That’s the B7 with the “ex short” mounting bracket. It says that right on it. It always attaches with 4 screws, although I had a factory 59 with a B7 that had a three screw attachment, so don’t freak out if your early 335 has the same thing. There should be a fifth hole under there for the ground wire if it was installed at Gibson. 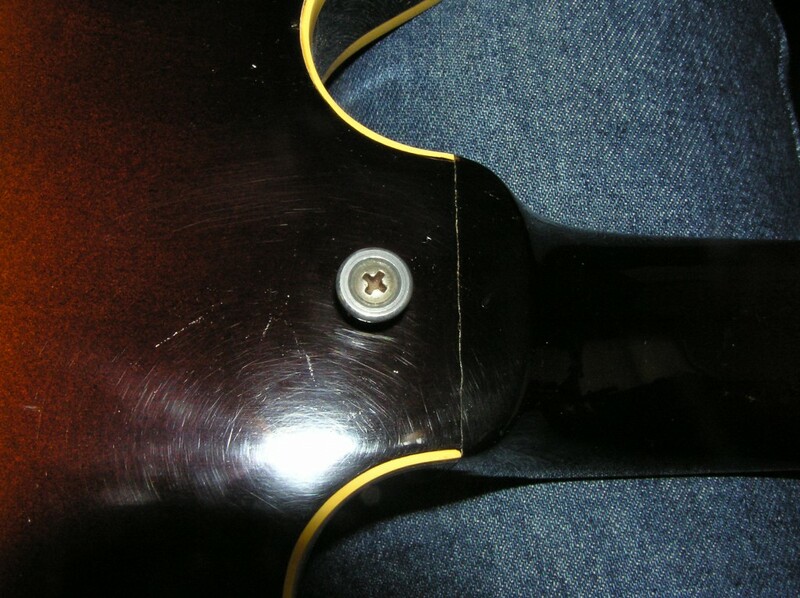 There are two screws that go into the top of the guitar that any 335 aficionado knows to look for when inspecting a prospective purchase. The B7 has a tension bar that the strings go under which gives the strings an acceptable break angle. You sometimes will see a B3 on a 335 but it is always an aftermarket mod and it will always have a shallow break angle because the unit is too short for the 335. A B6 would work better but so will a B5 “horseshoe” but they will look totally wrong so don’t but these on your 335. If you’re looking for a vintage Bigsby for your vintage ES, try to get one that is era correct. There are a couple of things that will help you tell the newer ones from the older ones. First, look at the string posts. On the older ones they go all the way through the shaft. The newer ones don’t (see photo). Also, look at the holes drilled in the unit for the two screws that go through the top. The older ones aren’t countersunk whereas the newer ones are. I don’t know what year the changes were made but I believe it was in the 70’s. Also look at where the Bigsby name and patent number are. 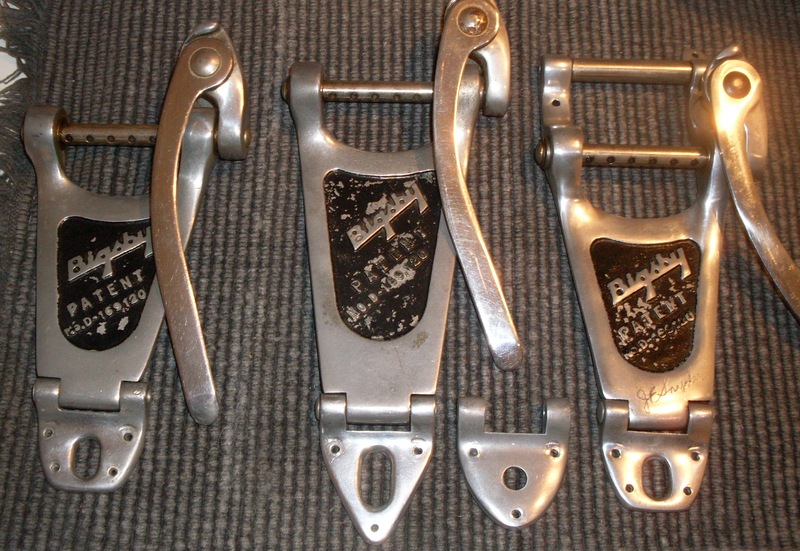 The older one has the Bigsby name and the patent number left unpainted. The newer one is entirely black except for the name Bigsby. I’m not sure when they made that change or if it is consistent-I have a factory Bigsby 63 with the patent number painted black. The ones from the 50’s often had no black paint there at all. 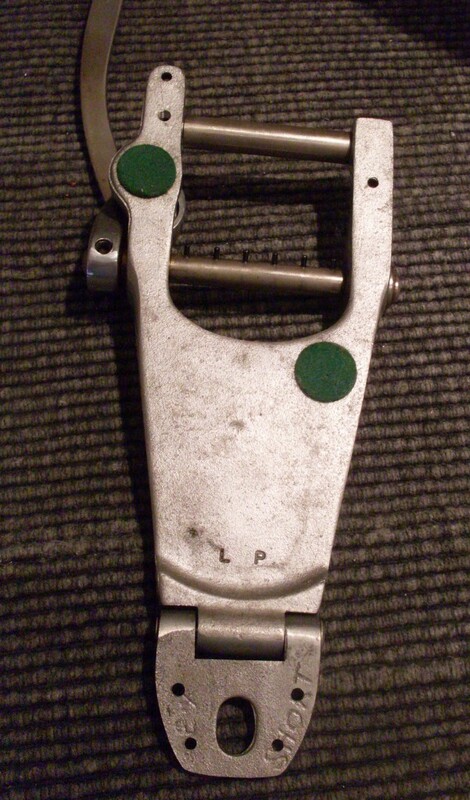 Also, the arm attachment changed somewhere around 1960 from a big Phillips screw to a stud with the screw on the underside. You’ll see gold ones with the screw until ’63 or so. The aluminum ones transitioned in 60-61, although I’ve seen two from late 59. So, if whammy you must, a Bigsby B7 is the ticket. Now you know what to look for. And don’t forget, that’s almost three quarters of a pound of added weight. Here's the bottom side. The designation "ex short" should be on the mounting bracket and the letters "LP" on the plate. I'm pretty sure they don't stand for Les Paul but actually stand for "long plate". But I could be wrong. 60's on the right, 70's on the left. Note the shaft where the strings wrap is different as are the screw holes and the paint of the plate. Do These Heels Make Me Look Fat? This '61 335 has a very typical heel shape. Short, square shouldered and straightish across the top. This 63 falls within the range as well. A little rounder on top but still short. someone wants to sell you a ’59 ES-335 and the heel is very rounded, I would look very closely at the neck join and the neck pocket because something ain’t right. I don’t have photos of every ES-335, ES-345 and ES-355 that has passed through the OK corral but I’ve got more than 100. I just went through them looking for a guitar with a tall rounded heel. I didn’t find one. The length of the heel varies as does the squareness of the shoulder but the top edge is always relatively straight or very gently rounded-not tall and rounded. I did find tall rounded heels–a 2007 Historic had one, an 84 had one as did an 82. I had an 83 with a tall squarish heel-too tall to be a 58-64. In fact, the 65 to 68’s I’ve had also have the short squarish heel as do the Trinis. 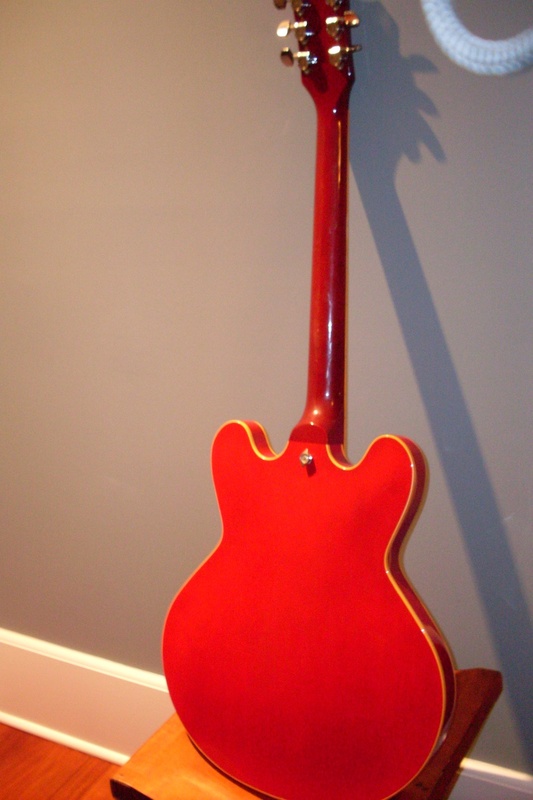 I recently had a renecked 64 that had a Memphis “fat neck”-also tall and rounded. There is some consistency among vintage 335s from the 50’s and 60’s and heel shape-within a range-seems to be one aspect that doesn’t vary much. And that’s a good thing because if everything else looks right and the heel looks wrong, you can be fairly certain that something isn’t kosher. Considering how inconsistent some ES-335 features seem to be-like centerblocks, neck size and shape, hardware and body thickness, it’s nice to see that heel shape can be pretty well counted on to be the same throughout the Golden Era. I’m sure there are exceptions-out of the 100 or so photos I went through in researching this post, I found only one that looked wrong for the era. So, if I may extrapolate, if you have a 50’s or 60’s ES-335, 345 or 355 and the heel is not pretty close to what you see here, you have a 1 % chance of it being authentic. Still flat and square in 67. This is what your 50's or 60's 335 shouldn't look like. This is an 84 and they tend to have the tall rounded heel. Even the Historics aren't quite right. This is a 2007 '59 Nashville Historic. You can see that the lacquer is broken right at the heel join but does that mean the structural integrity is compromised? Everybody who is considering the purchase of an expensive vintage guitar asks the same question. Any breaks, cracks or repairs? It’s the right question to ask and it’s also a hard question to answer. I’m going to concentrate on one area here. The heel-where the neck meets the body. This is not a weak point on an ES-335 and is rarely an issue (like it is on most SGs). 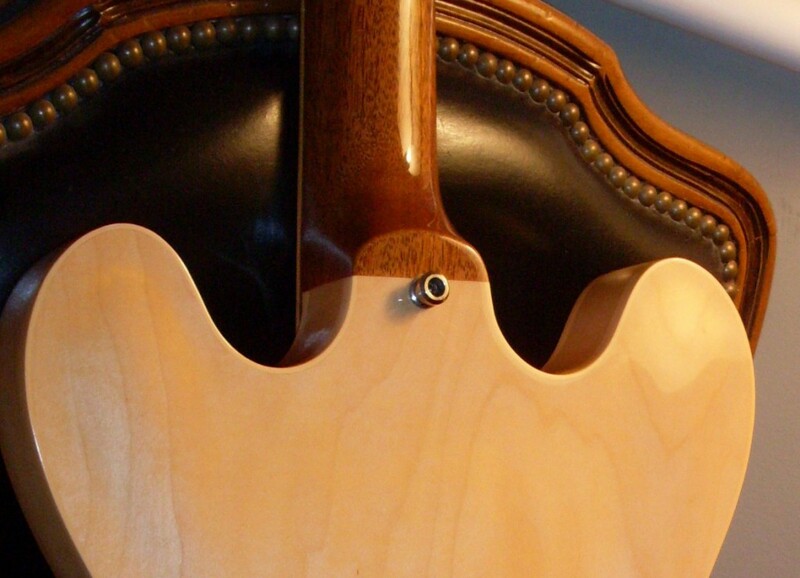 The long tenon design of the neck join has proven itself over more than 60 years. But there are still questions regarding the heel, so I’ll try to address them. Ideally, when seeking out a vintage 335, you want to minimize structural issues. 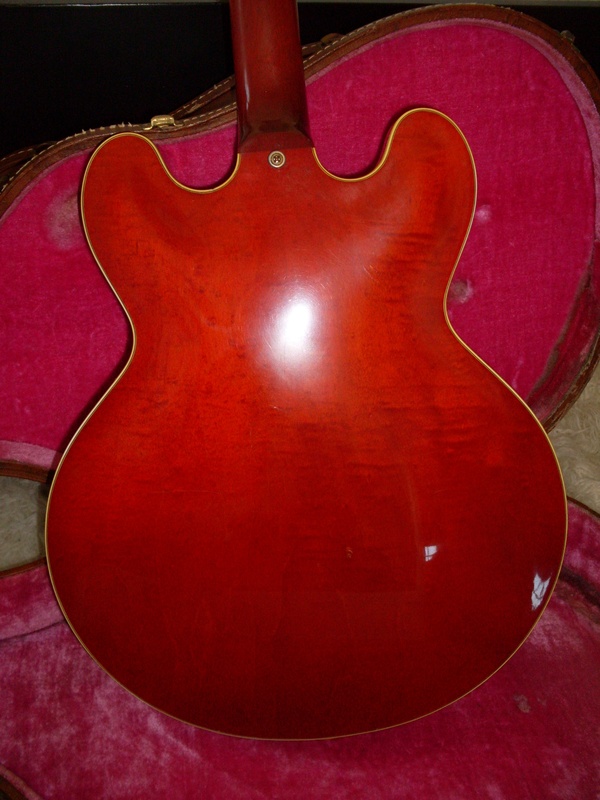 But a perfect neck join on any vintage ES is not so easy to find. By perfect I mean, no lacquer break at the join. It’s funny, most folks accept lacquer checking all over the guitar without batting an eye but if the lacquer is cracked along the seams at the heel, many buyers balk. The truth is that the lacquer across those seams is just as likely to check as anywhere else on the guitar. Perhaps even more likely since there is some “give” at any glue joint. Once the lacquer has completely cured (and an extra 40 or 50 years for good measure), it isn’t terribly elastic but the wood underneath still “breathes”. So the wood moves and the lacquer doesn’t. That’s what causes checking. Now, consider that a single span of lacquer crosses from the maple laminate body to the solid mahogany neck and you got two different kinds of woods moving with the heat and humidity and the lacquer having to stay intact. Not so likely after 50 years. I would estimate that 75% of the ES’s I see have a lacquer break at the heel. It usually just follows the seams and has nothing to do with the integrity of the neck join itself. It also gets full of crud like guitar polish residue and dirt so it often looks a lot worse than it is. It’s not hard to see a repair at the heel and it’s not hard to see a real stress crack in the lacquer. 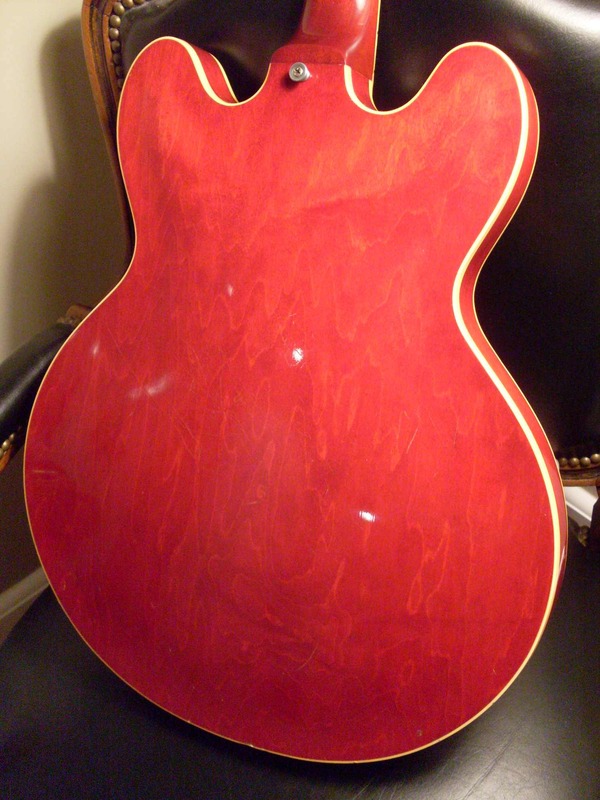 The lacquer at the seams can flake a little or bulge a little but as long as the glue joint is solid and shows no sign of repair, you shouldn’t worry too much about it unless you’re spending some big bucks on a mint guitar. By all means, use the broken lacquer at the heel as a warning sign to look more closely at the neck pocket (the neck pickup rout). It’s a pretty good indicator that something has been done in there but if you see no sign of a reglue or clamp marks or overspray at the heel, then don’t worry about the integrity of the neck join. Just a note, if you see shims on either or both sides of the tenon, don’t jump to the conclusion that repair work was done. Lots of guitars came from the factory with shims in there. Hand tools are notoriously inaccurate and if the tenon was a bit loose in there, a small shim was added. If you conclude that something is amiss in there, then by all means, pass it by if the price doesn’t reflect the problem. But if it’s simply a break in the lacquer at the heel, that isn’t enough to set off any alarms. Interestingly, it’s less of a concern on other Gibsons (particularly Les Pauls) because the heel isn’t flush with the back of the guitar. That “shelf” makes a lacquer break a lot less obvious and, in my limited dealings with LP’s, no one has ever even brought it up. Would I rather have a guitar with no lacquer checking anywhere? Yes but I know I’ll pay for it. 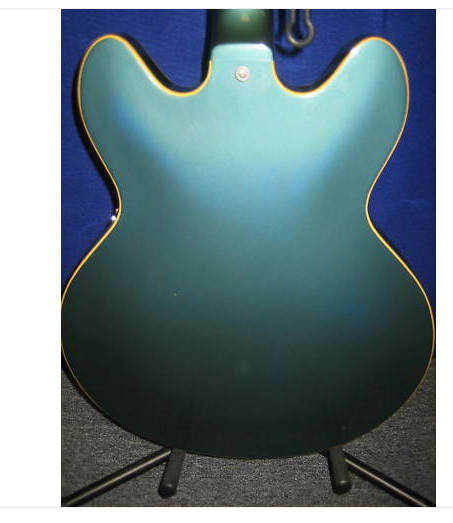 Would I worry about the neck join on this 59? Nope. Not for a second. This might seem really obvious to you but think about if your Mom was trying to tell the difference between these two guitars. Not so obvious anymore, is it? Dot neck on the left is worth a lot more than the block neck on the right. It's the little markers on the neck that I'm talking about. The neck is the long skinny part pointing upward. You knew that, didn't you. To my regular readers-this post is not for you. It’s for the people who have never seen a 335 before. 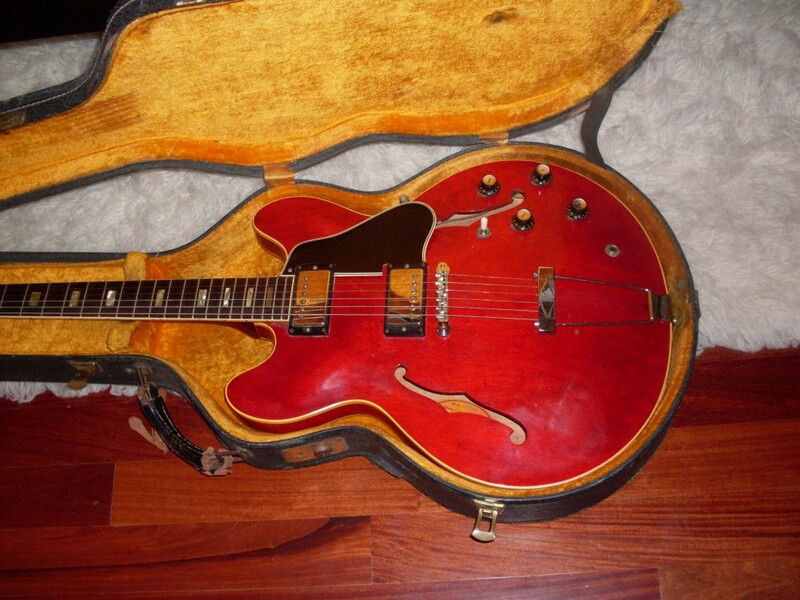 Recently, I’ve received a whole lot of emails from folks selling Granddad’s or Uncle Bob’s old Gibson ES-335. I appreciate the fact that folks are comfortable coming to me to appraise, buy or consign their guitar. I also appreciate the fact that they often do their research before contacting me so that they better understand what they have. Except when they don’t. Generally, the first email I get doesn’t contain any photos, just some information based on what Granddad “always said” or information gleaned from various websites. Now, I understand that to the disinterested or casual observer, all these guitars pretty much look alike. I don’t expect any non player to even notice the difference between a block neck and a dot neck. I do expect them to be able to tell sunburst from red but beyond that, I expect nothing. I used to ask a lot of questions about stuff that might be obvious to most of you that is Greek (or geek) to a non player. Question: ” Can you look at the back of the headstock and tell me the number stamped there?” Answer: “What’s a headstock?” This past week I received a very nice email from a nice lady who inherited Granddad’s ES-335. She wrote me and told me it was a 59 and asked what I thought it might be worth. I made the assumption that someone had been able to identify it as a 59 and I gave her a fairly broad price range but I also asked her, in the same email, what color it was. I wanted her to know that if it was blonde, she could double those big numbers I had given her. I’m sure she was very excited to hear that Granddad had left her something of real value. She wrote back and told me it was red. I could have had one of two reactions. “OMG, I’ve found another red 59!” or “Uh, oh. Not a 59.” I went with the latter. I asked for some photos and she sent them along. I felt bad telling her that the guitar I had told her might be worth tens of thousands of dollars wasn’t a 59 but a 68. I know, how can you get it that wrong but, as I said, to a non player, a dot neck and a block neck look the same until someone points out the difference. The next thing that probably boggled her mind was the difference a few years can make in the value of a guitar. A 68 is worth about one tenth of a 59, give or take. That’s gotta seem totally nuts to someone outside of our little asylum. So, here’s a quick primer for those who don’t know a headstock from an f-hole. If you have a 335 and the little markers on the fingerboard (the thing with the frets) are little dots and you know the guitar is more than 50 years old, it’s a 58-early 62 and probably worth a lot of money perhaps $20,000 or a lot more. If the tailpiece (where the strumming end of the strings end) is a simple bar and the markers are small blocks and you know for certain the guitar is around 50 years old, you have a 62-early 65 and it’s worth $10K or more. If the tailpiece is a trapezoid shaped piece that attaches to the very bottom of the guitar, then it isn’t going to be a big payday. That makes it a 65 or later and the value might be as high as $8000 but is more likely a lot less. That’s the simplest way I can think of to get a non player into the ballpark. I know I’d be disappointed if I thought my inheritance was worth $30,000 and I found out it was worth $4000. Next time, I’ll withhold my judgement until I see a photo. Stop tailpiece on the left, trapeze on the right. The tailpiece is the thing the strings go into -where they end (or start)/. The guitar on the left is worth more if it's original. 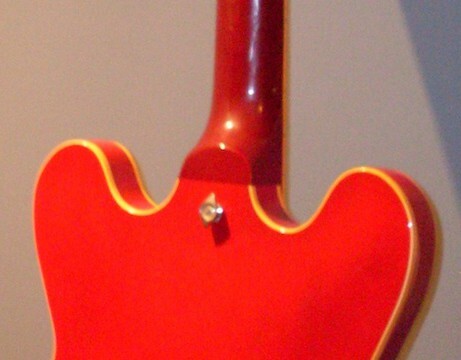 Lots of players take the trapeze off and replace it with a stop tailpiece. Look for the screw holes on the rim of the guitar where the trapeze attaches to the body to see if the guitar had a different tailpiece at some point. The body is the part that...never mind. This '65 might sound every bit as good as a 64 that costs twice as much. The Golden Era didn't end on Sunday and a "What a POS Era" didn't begin on Monday. The "What a POS Era" really didn't start for another 5 years or so. And that's just my opinion, 70's players. 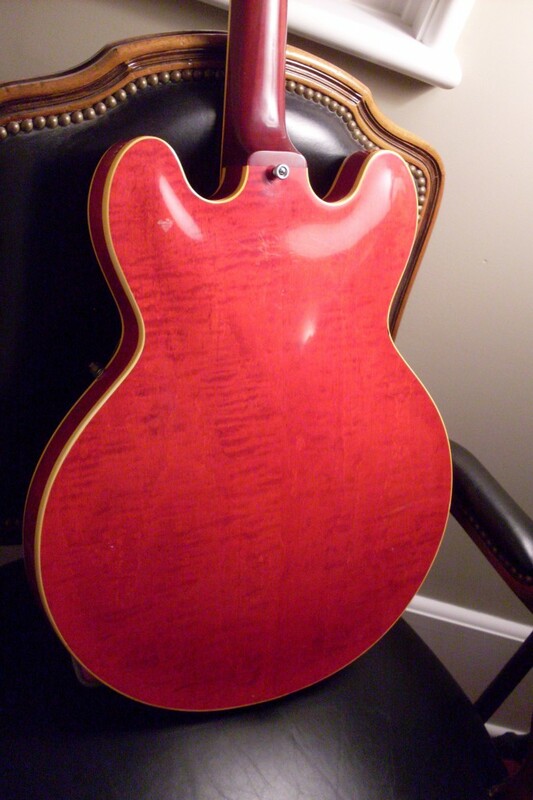 Most Gibson guys refer to the period from 1958 to 1964 as The Golden Era and there is some validity to that. Certainly, the most valuable Gibson electrics were made during the era (although not the most valuable acoustics (and mandolins and banjos). But what makes them that much better (and more expensive) than, say, a 65 or a 68. A lot of it has to do with popularity. What do collectors and players want? The Golden Era has a few things going for it that make them more in demand but are these things necessarily better? Wide necks are a good place to start. In 1965, players didn’t want wide necks. 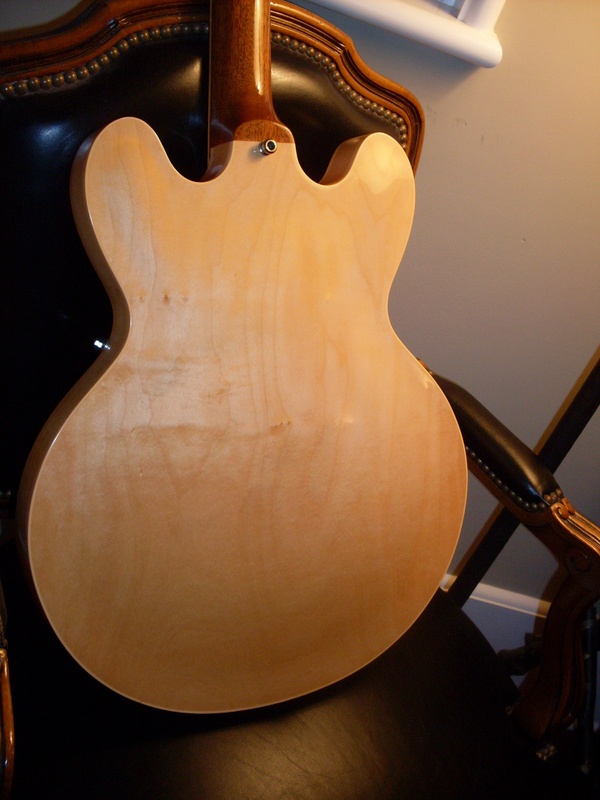 The trend was toward more “Fenderlike” necks and that meant 1 5/8″ or less at the nut. 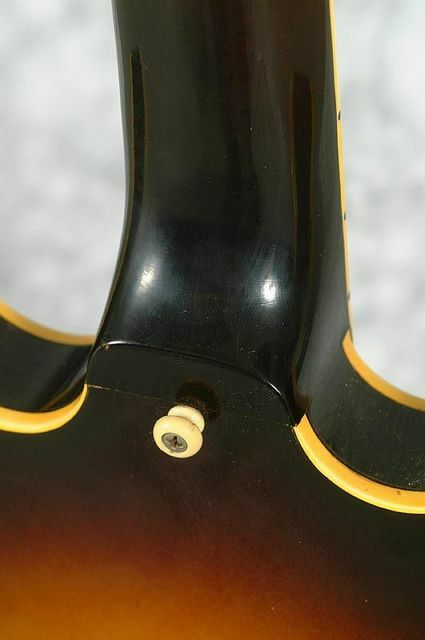 Gibson responded in mid 65 and standardized the nut width at 1 9/16″ where it would remain (with some exceptions) through 1981. Today, people want a 1 11/16″ nut. Is it better? Well, it’s better for me but that’s just a matter of comfort and playability. If you can play a 1 9/16″ nut, then perhaps you should look more closely at 65-68 ES models. What about pickups? No one is going to argue about how good a PAF can sound. Can sound. Not sounds. Not all are stellar. I’ve played plenty of later guitars with wonderful sounding pickups-not as good as the best PAF but certainly better than the worst. The post PAF but pre T-top pickups are mostly excellent. 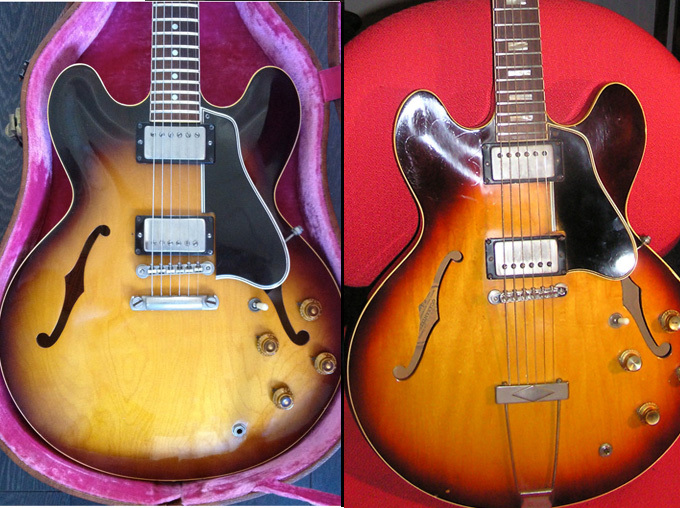 You can be fairly certain that if the cover is nickel (on a 335, anyway), then the pickup is the same as a late PAF. If you have a pre ’65 gold hardware guitar, the chances are awfully good that you have the same pickup because Gibson went through their remaining stock of gold early patents (and PAFs) more slowly. There is a prevailing myth that T-top pickups showed up in 1965 and that if you want a pickup that sounds like a PAF, anything after 64 is going to be a crapshoot. Myth. Not true. I’ve never had a 65 with T-tops. Granted, I don’t open every pickup I get but it’s a pretty good bet that up to 67, you won’t get one. I’ve had a 69 335 with pre T-tops as well, so they are around for awhile. They won’t have the enamel coated windings of a PAF, so the tone is somewhat different but they are still quite good and very consistent. So, if you want the tone of the Golden Era but not the price and you can handle the narrow neck, then a 65 or 66 or 67 might be just the ticket. Wait, there’s more. What about the demise of the stop tail in early 65? Don’t stoptails sound better than trapezes? Different? Yes, a bit. Better? Well, stoptails look better, I think, but I can’t say they necessarily sound better. It seems like they should, given the physics of a guitar and its tailpiece but, to be truthful, they don’t. I’ve played a few 65’s with trapezes that will keep up with any 64 for tone and sustain. It seems that most of the sound is transmitted through the bridge posts and those are identical. What about 68 and later? There is another prevailing myth about 68’s that I’ve mentioned and it doesn’t seem to want to go away. I’ll say it again. 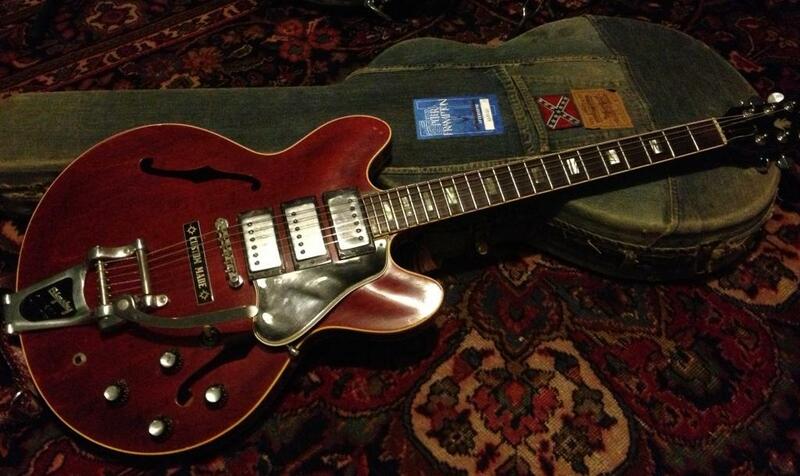 1968 ES-335s do not have a 1 11/16″ nut. I don’t care what a certain popular (and mostly accurate) website says. The necks can be pretty chunky but they are still narrow. 68’s can be a good choice if you can handle 1 9/16″ but there’s a pretty good chance that the guitar will have T-tops (still a decent sounding pickup). They have bigger f-holes and they look a little funny to me but they are made pretty much the same as a 65. It’s the 69’s you have to watch out for. 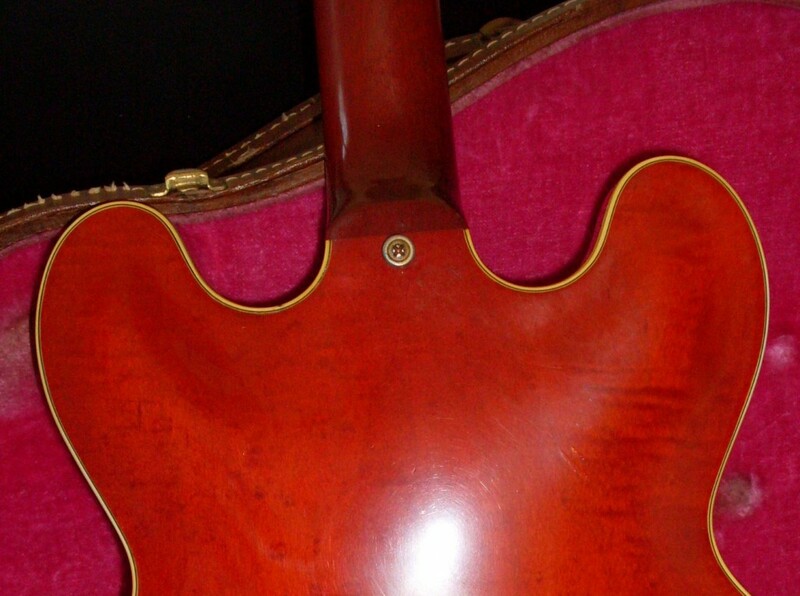 The neck tenon all but disappears early in 69. The one piece neck goes away. The dreaded volute shows up. And from there it’s all downhill until the early 80’s. 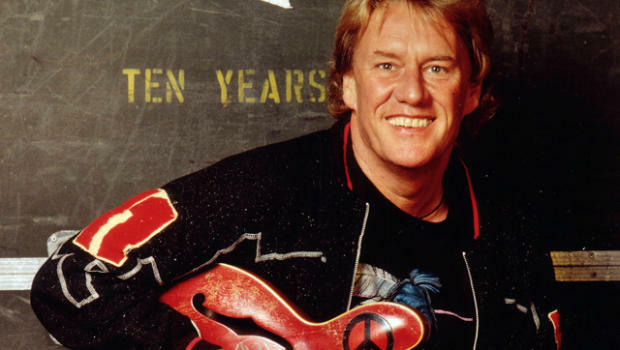 RIP, Alvin Lee. The guy could play. I’ve often said a good guitar player makes me want to pick up my guitar and play but a great player makes me want to put it down forever and do something else. When I was a teenager, I was a pretty good player for a kid. I got a pretty early start and had some decent dexterity and in the rarefied atmosphere of Scotia-Glenville High School in 1968, I was THE guitar player in THE band. There must have been at least 8 or 10 local bands who could at least put together a decent set of covers but the big gigs went to us. We were six pieces and vocally driven. Two up front singers-one male, one female-set us apart from the bands who could do everything but sing. We hauled a big ol’ Hammond B-3 to every gig and humped it up a lot of stairways along with a backline that could fill a stadium. No roadies. Just the band. Two singers, keyboards, bass, guitar and drums. I had been playing in bands since I was 13 and really believed my career was going to be that of musician. There were certain players I looked up to whom I felt I could emulate and not have to push beyond the limits of my talent. George Harrison, Pete Townsend, Keith Richards and a few others managed to be great players without being so scary good that I never wanted to pick up a guitar again. I loved their playing but they never seemed to step out beyond what seemed humanly possible-I believed I could be that good with some years of practice. Then a guy named Hendrix came along and then another guy named Lee and everything changed. Those two players showed me the limits of my skillset and for that, I should be grateful. The life of a musician would have taken its toll, I’m certain. When I first heard Jimi, I knew I couldn’t make my guitar do what he did. But I was able to convince myself that some of it was because he was a lefty playing upside down. His notes didn’t flow like the rest off us and I accepted that. Then, I heard Alvin Lee. They called him “the world’s fastest” at a time when that actually mattered. As players began pushing the limits of the instrument to new highs, velocity became more important-probably more important than it should have been. Instead of inspiring me to work harder, Alvin Lee showed me my limits. I would never play like that. He wasn’t my favorite player-that goes to Harrison and Clapton but he was the one who opened my eyes to the fact that the guitar is just the vehicle. The player is the driver. When I heard “I’m Going Home” the following Summer, I was still playing but Alvin Lee took away a lot of my confidence. I knew, at the moment I heard the Woodstock recording, that I was never going to be that good. Not ten years after, not in a million years. And that’s a good thing to know. It gives you perspective and direction. My direction went elsewhere but I didn’t put the guitar down. I just put it into perspective. So long, Alvin Lee. I actually kind of like this one posted on the Les Paul Forum. Nobody would dream of doing it now but back in the day, who knows? I'm really digging the blue jean case. 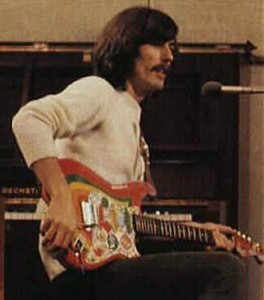 If I had a 63 Sonic Blue Strat, I'd paint it to be like George. Honest. reinstalling a harness is a pain on any ES, is it really so hard that you have to cut a giant hole in that back and put on a plastic cover? Got a big ol’ router at home? I know, let’s put on a Kahler trem. Seen it more than once. How about this? Supposing your ’62 had black bobbin PAFs and you really, really wanted white ones? I know, let’s paint them. No one will know. They did a very good job and then put the covers back on. Don’t ask. I can’t tell you how many guitars have come to me with stickers (or sticker residue) on them. I think that was a 60’s and 70’s thing. I think I put a sticker of some sort on my old Fender Duo-Sonic when I was in the eighth grade. It probably said something really stupid like “kick out the jams” or some antiwar slogan like “make love, not war”…made sense in the eighth grade in 1966-now? not so much. What did “kick out the jams” even mean? 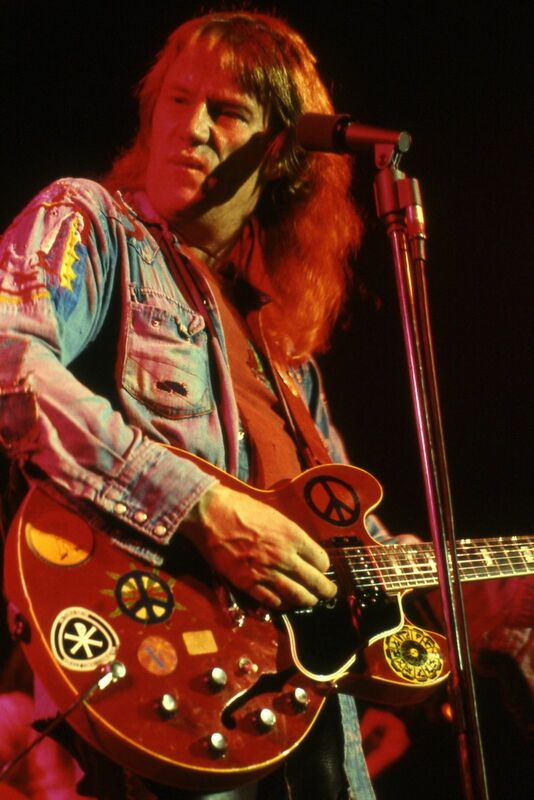 Alvin Lee seems to have had a thing for the stickers and we all liked Alvin Lee. And for the not so faint of heart, how about a psychedelic paint job? I don’t see that on 335’s much. Seems like more of a solid body thing. Eric Clapton’s SG and George’s Strat were good examples and we all liked George and Eric. And yet, I never painted any of my guitars-probably because I had no money for paint-I had spent all of it on guitars. How about double pick guards? A third pickup? Or how about cutting away the f-hole under the guard so you can get the harness out easily. Hey, nobody will ever see it…it’s under the guard. I’ve seen that more than a few times. And it hurts just as much each time I see it. Oh, third pickup isn't enough for you? How about some stickers. Make it distinctive enough and Gibson might make a "artist" model just like it.